Yesterday in the ongoing olympics in Beijing Jamaica won 100 meters for women. 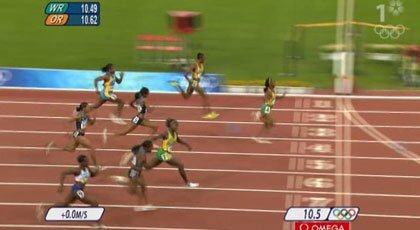 Not only did Shelly-Ann Fraser win in style in 10.78 sec, Jamaica took a tripple winning all three medals. This was just to much for the United States. The US team protested the results, asking that the race be reviewed because of a possible false start by American (!) Torri Edwards -- who wound up last. The appeal was swiftly rejected, and the biggest consequence was that the Jamaican women would have to wait until today to receive their medals at a postponed ceremony. Sour grapes, said the fox.